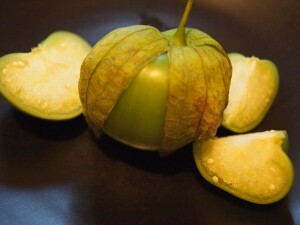 Tomatillos are a type of fruit closely related to tomatoes with similar uses. Two good things to know about tomatillos is that the husk is inedible and that the outside of the fruit inside the husk may be a little slimy to the touch. This doesn’t mean the fruit is bad, just that you may want to wash it before using. For me, there are two major differences between tomatillos and tomatoes. First, tomatillos have less acid and I describe them as tart and fruity compared to tomatoes which are (at least in my vocabulary) bright and savory. Second, tomatillos are high in pectin which is the same carbohydrate that is used as a gelling agent in most jellies and jams. So, again, comparing them to tomatoes, if you use tomatillos in a salsa or stew they will have a somewhat thicker consistency, whereas tomatoes are typically juicier. If you are buying fresh tomatillos make sure that they are firm and that the color, typically green, is vibrant. You may also be able to find whole or crushed tomatillos canned. These can be good for some recipies, but as usual, I prefer the fresh fruit.